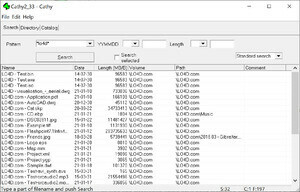 Cathy is a simple and very fast cataloging tool that allows you to organize detailed lists all files and directories whcih have been stored on external devices such as flash disks and CDs. With these lists you create neatly organized catalogs. Furthermore, it allows you to search for a particular file directory or go without inserting the corresponding CD or diskette into the drive. Searches can be performed by name, size and date, and you can also find duplicate files and files with the same name or size. Version 2.31.3 is a freeware program which does not have restrictions and it's free so it doesn't cost anything. For security reasons, you should also check out the Cathy download at LO4D.com which includes virus and malware tests. Additional screenshots of this application download may be available, too.